Kris Delarosby, right, and Colleen Anderson, left, hold Charleen Jochim as they walk toward a hospital in search of information about a missing friend, Steven Berger of Minnesota, Oct. 3, 2017, in Las Vegas. The parents of Berger, who had been missing after the mass shooting in Las Vegas, said they had been notified Tuesday afternoon that he was killed in the attack. Las Vegas sheriff Joseph Lombardo says he "absolutely believes" investigators will find a motive for the worst mass slaying in U.S. history. Investigators are mystified about why Stephen Paddock, 64 — a man who was financially well off and with no criminal record or apparent political or religious ties — opened fire on a country music show Sunday night, killing 59 and wounding 527. Lombardo said Tuesday at a news conference that this was obviously an extensively premeditated massacre. He said he was pretty sure Paddock evaluated everything he did. "We cannot even rule out mental illness or some form of brain damage, although there's no evidence of that either," a Department of Homeland Security official said Tuesday. The sheriff gave few details of what investigators have found so far. But he did say Paddock fired from the 32nd floor of the Mandalay Bay hotel for nine to 11 minutes before shooting himself. A compilation of video from police body cameras while the bullets flew showed a scene of chaos and confusion. Officers scrambled to determine where the gunfire was coming from while shouting at people to "get down" and "get back." 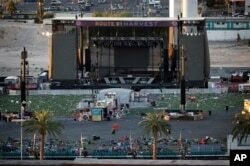 Debris litters the festival grounds across the street from the Mandalay Bay Resort and Casino, Oct. 3, 2017, in Las Vegas. Authorities said Stephen Craig Paddock, perched in the resort's hotel, used a cache of weapons to kill dozens and injure hundreds at a music festival at the grounds on Oct. 1. Lombardo said agents from the federal Bureau of Alcohol, Tobacco, Firearms and Explosives were looking into whether Paddock used what is called a "bump stock," a device that alters a semiautomatic weapon so it can fire bullets faster. Police have recovered a total of 47 weapons from three different locations — the hotel room, and Paddock's homes in Mesquite and Verdi, Nevada. They also found numerous rounds of ammunition and explosives in his car. Lombardo also said Paddock's girlfriend, Marilou Danley, is in the Philippines and is a "person of interest." He had no comment on reports that Paddock wired $100,000 to the Philippines shortly before the massacre, but it is unclear who the money was for. Paddock had cameras inside his room and at least one set up on a food service cart outside the door. Lombardo said there was no video of the shootings from those cameras. A Las Vegas police officer stands by a blocked-off area near the Mandalay Bay Resort and Casino, Oct. 3, 2017, in Las Vegas, which is near the site of the Oct. 1 mass shooting by Stephen Craig Paddock. Lombardo said police and Mandalay Bay hotel security saved hundreds of lives because of their quick response. The sheriff said all but three shooting victims had been identified. Some of the wounded got away from the immediate area, only to die a few blocks away. Many of those hurt were trampled or injured while scrambling over fences. President Donald Trump will go to Las Vegas on Wednesday to meet with police and first responders and to console the victims. He described Paddock as "a sick man, a demented man, a lot of problems, I guess, so we're looking into him very, very seriously." Charlene Ragsdale pauses at a memorial in Las Vegas, Oct. 3, 2017, for those killed Oct. 1 when a gunman opened fire on an outdoor music concert. The president also commended law enforcement and first responders. "And what happened in Las Vegas is in many ways a miracle. The police department has done such an incredible job," he said, adding that the issue of gun laws would be discussed "as time goes by." Paddock's brother, Eric, was just as baffled as police by the shooter's motive. He said the family was "horrified and bewildered." He said his brother had plenty of money and had no known political or religious affiliations, no ties with white supremacists and no history of mental illness. "Where the hell did he get automatic weapons? 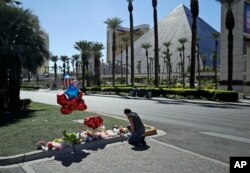 He's a guy who lived in a house in Mesquite and drove down and gambled in Las Vegas," Eric Paddock said. A woman reacts during a special service at Guardian Angel Cathedral after the mass shooting on the Las Vegas Strip, Oct. 2, 2017, in Las Vegas. The nation and the world has opened up hearts — and wallets — to help the Las Vegas victims. A victims fund has collected $3.7 million so far, and blood donations have exceeded the immediate need. 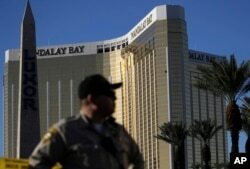 Officials said the donations had been as small as $5 and as big as $3 million, from MGM Resorts International, which owns and operates the Mandalay Bay resort and many other entertainment properties.